CPLA Lighting 3d Jupiter light use 3D printing technology, print layer by layer aims to provide you the true appearance of the Jupiter. 3. Do not put the Jupiter lamp under the blazing sun for long time. 4. Do not put the Jupiter lamp on the fire or close to high temperature source, to avoid the fire accident or explosion. 5. This jupiter lamp is a decorative light, please do not use it like a toy. 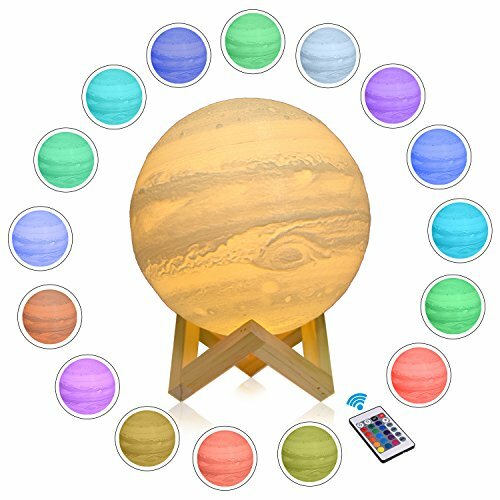 【2018 Newest Version】16 Colors Jupiter lamp is a remote and touch control LED Lamp, including 16 color RGB, flash and fade modes. Just use the remote control to change the color or the brightness of the color. Touch switch can only change the color and remote control can adjust the brightness of any color. 【Safe and Reliable】Adopting low voltage USB charging and energy efficient LED light bulb, the lamp stays cool even after long time use, and gives off fliker-free soft light which would not hurt eyes. By using PLA material extracted from corn stalks, the lamp is odorless and non-toxic. 【No assembly required, integrally molded】Seamless table lamp with the diameter is 7.1 INCH(18CM), made with 3D printing technology, realistic Jupiter shape, the surface of the jupiter lamp is very close to the real jupiter, novelty and charming. 【A perfect gift】Express your love with this warm gift at any festival. Your kids or beloved one are unable to resist this charming gift. And it's also a great decoration & creative lights for your house. 【Quality Guarantee】Our goal is to provide you with a quality product. We aim to make you happy with your purchase. However, if you're not completely satisfied, then CONTACT US and we will give you a 100% refund within 90 days of purchase. It is our intention to offer the BEST customer service on Amazon. If you have any questions about this product by CPLA, contact us by completing and submitting the form below. If you are looking for a specif part number, please include it with your message.